1F Re-Arming Kit for Halkey-Roberts Cylinder Seal Indicating Inflators. 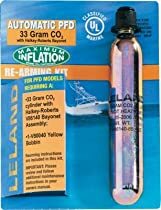 Kit includes: Yellow-Bobbin (1) and Bayonet Style CO2 Canister (1) These kits are generally used on new model Revere Inflatable Life Vest/PFD's, SOSpenders Inflatable Life Vest/PFD's, Stearns Inflatable Life Vest/PFD's, auto inflatables using the 1F seal indicating auto inflator. Got wrong one didn't seem concerned. Checked other sources but finally settled on purchasing this cartridge as it matched the one being replaced. Thought that the price charged was rather on the high side but needed it to make my PFD workable. Cheap insurance I guess; Paid $31 for this item; seemed rather steep as my PFD cost under $100. The cost ratio PFD/Replacement cartridge seemed out of line.